Have you ever designed a business model for a Startup? Then you probably needed to figure out your Distribution Strategy. Distribution is probably one of the hardest parts for a Startup to figure out. Most founders need months or even years before they have figured it out. When done correctly you reach Traction and the Sky is the limit. At Holland Startup our co-founders, all University Graduates and first time entrepreneurs, ask me how they could develop their Distribution Strategy. We talked about: What’s the conversion process looks like? What’s the right Communication Channel to use? Does this Channel fits the purpose of your Call-to-Action? Can you communicate the Call-to-Action so your user Converts? In this post I try to explain what process I use to design a Distribution Strategy. Design and test per Process step a single message with one Call-to-Action. User Acquisition Process x Number of Channels x Call-to-Action = Hyper Growth! 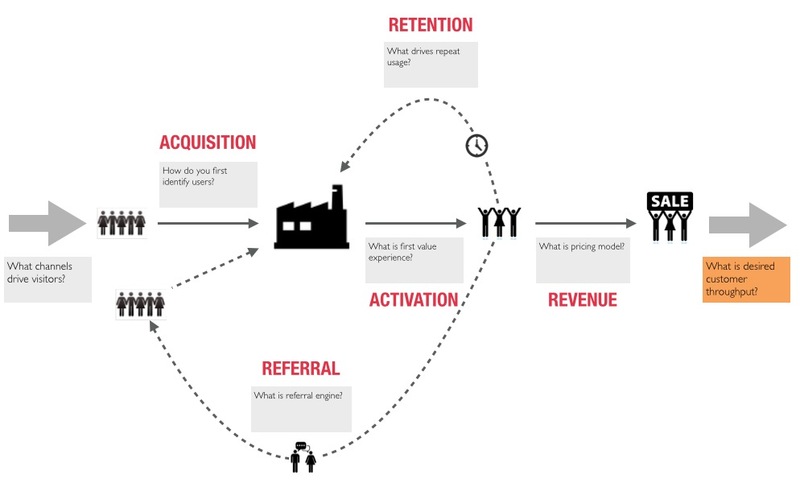 First you need to figure out your User Acquisition Process. I personally like AARRR. AARRR is an acronym, designed by Dave McClure founder of “500” a Silicon Valley based Accelerator, and it stands for; (A)cquisition, (A)ctivation, (R)evenue, (R)etention, and (R)eferral. AARRR provides a blue-print to gain hyper growth. As marketeers we can measure conversion metrics and optimize conversion in each process step (AARRR). Search; paid and organic (free). It’s Googles Business. I have taken the liberty to match the channels for you. Please bear in mind you need to test each combination within your own business model. Now you have defined your process and tested all channels is time to transmit your message to your customer and test different Call-To-Actions to optimize conversion rates in each individual process step. One last note; on using Social channels to share your blog posts or any other piece of content (pictures and videos). I learned you need to share your content multiple times. So when it’s out, for the first time, schedule it (either automated or manually). Good luck. Any add-ons, comments, channels I did not think of, please respond? ← How to Open Every Door?